Visiting Trinidadian lawyer, Marlon Moore, who is also a tutor at the Hugh Wooding Law School (HWLS), believes that everything should be done to fast track the process for the establishment of the JOF Haynes Law School here. Moore was responding to a question posed by Kaieteur News in relation to some of the hardships students from the University of Guyana (UG) Law Faculty are faced with in moving to obtain their Legal Education Certificate (LEC) from HWLS. Each year, the top 25 students from the Law Faculty gain automatic acceptance to the HWLS to read for their LEC—a prerequisite to practise law in Guyana and the Caribbean Region. This is in comparison to the scores of Trinidad natives who graduate each year. Moore, 51, knows too well of the struggles as he left his family behind when he decided to pursue his LEC at the Eugene Dupuch Law School in the Bahamas. He obtained his Bachelor of Law degree from a University in London. He has been practising since 2005. The tutor reasoned that with Guyana having its own law school, the pressure of students finding over $2M for tuition for the two-year programme at HWLS would be drastically reduced. In addition to that amount, students still incur expenses for boarding, food, transportation and other basic necessities. 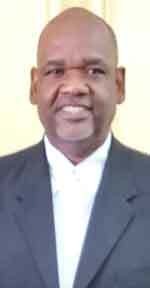 During this time, he has become a mentor to many Guyanese students attending that law school. “Dedicated” and “hardworking” were the words he used to describe Guyanese students who he has encountered at HWLS. Although miles away, he would still keep in touch with his past students from Guyana some of who turned up at the High Court in Georgetown on Friday to witness his admission to the Bar Association of Guyana. The simple, yet significant ceremony saw Moore and several of his past students reflecting on the good old days at the HWLS.